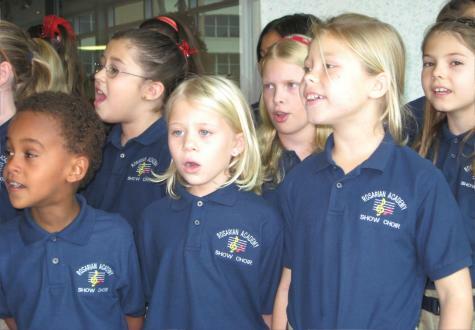 Show Choir members at Rosarian Academy, from left, first row: Menab Said, Bree Heyniger and Leah Steele; second row, Kayla Becerra, Lillian Cooney and Ania Johnson. Rosarian Academy recently brought Christmas joy to Lourdes-Noreen McKeen residents. The academy Show Choir, featuring 45 pupils in grades 2 through 8, sang holiday music for residents of the McKeen Residence in West Palm Beach. Following the 30-minute program, students had cookies and juice with residents and staff. "The Show Choir performs several times throughout the holiday season, but this was by far the most meaningful for the students," said Gay Dedo, Rosarian music director. "It was rewarding for the children to see how much joy they brought to the residents, who were clapping and singing along." Musical benefit � Dorothy L. Lappin and Simon Benson Offit co-chaired another event to benefit the School of the Arts Foundation Inc.
One Night Only, a special presentation of FAME the Musical, drew more than 280 guests to the Alexander W. Dreyfoos School of the Arts' Meyer Hall in West Palm Beach. 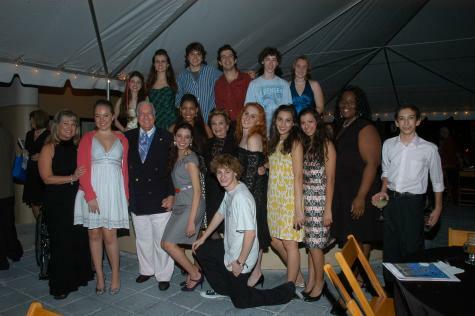 Guest were greeted on the red carpet by Dreyfoos communication arts students and serenaded by a string ensemble prior to the musical, which portrays the lives of students attending a performing arts school in New York City. Following the show, guests joined the cast and crew for a post-production reception in a tent outside the theater. The event raised more than $95,000 for the School of the Arts Foundation, which provides enhancements to the arts and academic curriculum at the arts magnet high school. Hispanic studies � Eighth-graders at Poinciana Day School in West Palm Beach have been studying Hispanic countries in their Spanish class, including Hispanic culture and the written and spoken language. Among the countries is Costa Rica, and each student selected one aspect to research, including native animals, food, artists, clothing and music. The students created posters portraying their area of research as a visual aid for their oral Spanish presentations and concluded their unit with a fiesta. The honored guest at the fiesta was Head of School Nixie Swift, who toasted the students. Swift also lauded teacher Jael Nolan for her creativity in the Spanish program. "Students are excited to learn about other countries and their cultures because it is presented in such a vibrant manner," Swift said. All Poinciana students, kindergarten through eighth grade, participate in Spanish classes, with the emphasis on learning how to converse in the language at all age levels.